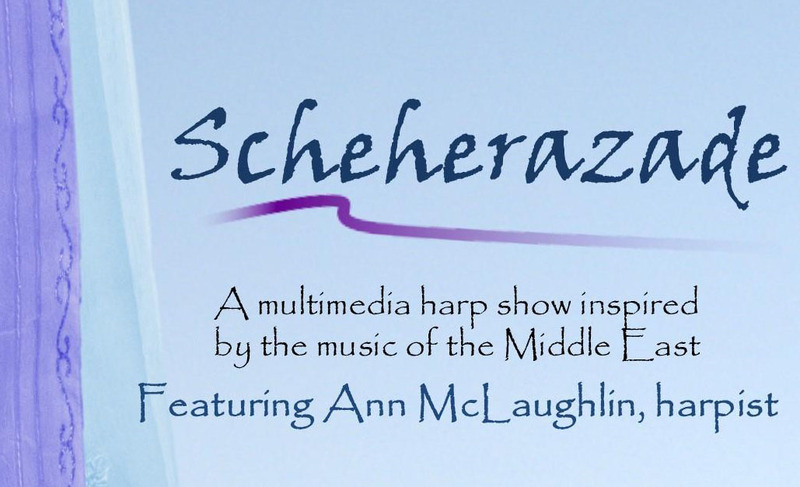 SCHEHERAZADE is a multimedia harp show inspired by the music of the Middle East. Harpist Ann McLaughlin presents a solo harp show interweaving live harp, percussion, and vocals with animated videos and theatrical lighting to create an evocative atmosphere enhancing the Middle Eastern inspired music of the performance. The centerpiece of the performance is a 15-minute arrangement of Rimsky-Kosakov's Scheherazade symphony for solo harp with animated images - inspired by Scheherazade's tales - synchronized to the music. This exciting event is McLaughlin’s first show at Parkland College since her Celestial Strings: an Evening of Harp Music and Stargazing concert in January 2013 and is sure to delight audiences with its enchanting take on storytelling through music. $5 admission. Tickets sold only the evening of the performance. Lobby will open at 6:30pm. Paid for in part by the City of Urbana Arts Grant and the Illinois Music Entrepreneurship Grant from the University of Illinois School of Music AVL/eDream provided visual elements and consultation for the multimedia presentation.